ICRC Archives, Geneva (2015). By Johannes Paulmann (Own work) [CC BY-SA 4.0], via Wikimedia Commons. Since its foundation in Geneva in February 1863, the International Committee of the Red Cross (ICRC) has sought to keep all documents it has produced or received. The founders could not have foreseen that the ICRC would become the oldest extant humanitarian organization after more than 150 years. However, they wanted to make sure that in case their “creation” should disappear, traces would remain on the work they have done for the welfare of humanity. Once the ICRC seemed quite certain to continue its duty, after the first International Conference of the Red Cross in 1867, archives were organized for the day to day work. 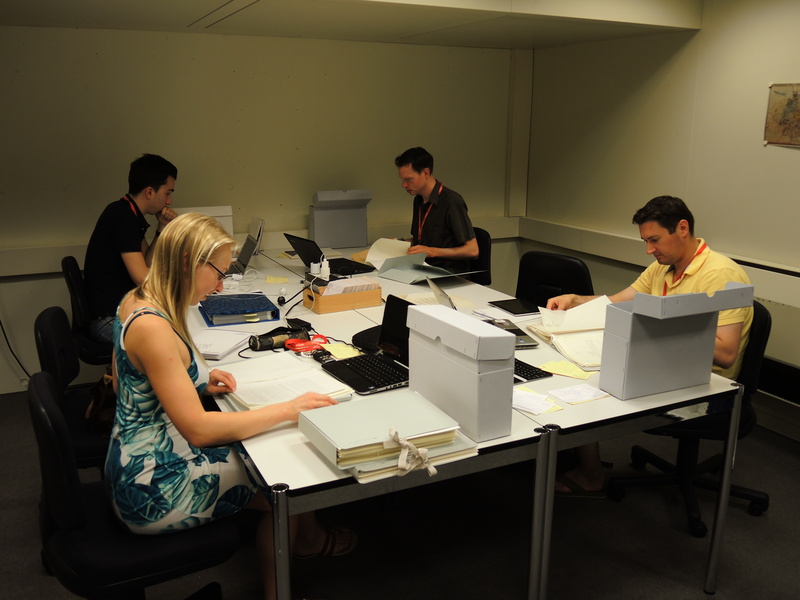 It was only in 1996 that part of the ICRC archives were generally opened for external researchers. The documents kept here serve an important function in preserving the memory of delegates as well as those who benefited from the ICRC activities. The first mention of an “archivist” in charge of looking after the ICRC documents (mainly correspondence with National Societies of the Red Cross) dates from 1869. Since the First World War, the ICRC remained a quite small organization (ten people in all) and its secretary also played the role of head of the archives and the library, which were located in the same private apartment where the members of the ICRC met. It was only after 1918 that a real secretariat was organized which centralized the archival work. A division of the archives was then created in 1946 under the responsibility of a female archivist, Miss Young, who later became the head of the archives at the UNESCO. Old archives started to be inventoried and a filling system was adopted in 1951, which is still in use today. The “Reference Files” since 2010 (electronic archival). Including the logistic and administrative files, the ICRC Archives total 13,000 linear meters in Switzerland, mainly in Geneva. The 80 ICRC delegations around the world keep archives, too. These are still current archives used for day-to-day work. These archives are repatriated on a regular basis, in order to be sorted out and prepared as historical archives to be conserved by the ICRC. These delegations’ archives total some 8,000 linear meters of documents. Among the ICRC archives, one distinguishes the general archives, which informed about the ICRC activities and policy and are constituted by the correspondence received and sent, the mission and visit reports, the minutes of institutional bodies, etc. ; and the archives of the ICRC Tracing Agency composed mostly by individual data on war victims (prisoners of war, political and security detainees, interned civilians, civilian populations at risk). Created since 1870, these Tracing Archives today represent an enormous collection. For instance, the files for the Second World War contain more than 36 million of index cards. Apart from the “paper” documents, the ICRC public archives also contain audio-visual material, with a very huge collection of films, videos, sounds and photos. Each of these collections are managed by archivists who are specialists in the topic. If these archives have historical value, they also continue to fulfil humanitarian purposes, because they are still used to deliver captivity attestation, which are used by the beneficiaries to officially claim their rights to compensation linked to their status of former victims. In this sense, the Tracing archives are still “living” archives. The importance of the ICRC Tracing Agency has been recognized at an international level; in 2007, the UNESCO has decided to put the Archives of the International Agency for Prisoners-of-War down for the Memory of the World Register (1) recognizing the world importance of these archives. Being an institution of Swiss private law, the ICRC has no formal legal obligation to keep and to communicate its archives. And, for a long time, the ICRC general archives have been closed to the public consultation. In 1973, the ICRC edited its first archives rules, granting an access on derogation only. But, under criticism for its non-transparency about its history, especially those of the Second World War, the ICRC decided in 1996, after long internal discussions, to open its archives for the period 1863-1950. This decision was taken to respond to the wish expressed by historians to consult ICRC documents, but also by several memorial institutions such as Yad Washem World Centre for Teaching the Holocaust (Jerusalem), the United States Holocaust Memorial Museum (Washington) and the Centre de documentation juive contemporaine (Paris), which wanted to complete their own collections with ICRC material. Copies of the ICRC pertinent archives (for instance, those dealing with the ICRC activities for the deportees) were offered to these institutions. It is obvious that not only historical but political considerations also underlay the ICRC decision. For this first declassification, new access rules have been drafted, and revised after the second declassification, which took place in 2004, and made public a new period of the ICRC general archives (1950-1965). Under these new regulations, the general archives over 40 years are open to the public; but general archives containing personal or medical information are submitted to a protection delay of 60 years. A third process of declassification was launched in 2010 for the period 1966-1970, but it encountered strong resistance inside the ICRC. The declassification has been delayed until June 2015, when the general archives covering the period 1966-1975 have been opened. With this third opening, more than 8,000 linear meters of documentation are now accessible to researchers interested on the history of the ICRC, of the Red Cross Movement, of humanitarian law and humanitarian assistance, and more generally on the history of wars and its victims. Daniel Palmieri is a historian at the ICRC. He was a participant of the Global Humanitarianism Research Academy (GHRA) 2015. Citation: Daniel Palmieri. ‘Geneva, 1996: The International Committee of the Red Cross Archives’, in Online Atlas on the History of Humanitarianism and Human Rights, edited by Fabian Klose, Marc Palen, Johannes Paulmann, and Andrew Thompson, 2015-12, urn:nbn:de:0159-2016090560 [2019-04-26].